If you’re learning how to play the guitar, there’s no better place to start than with this Fender beginner acoustic electric guitar. It’s the CD-140SCE model that has a lot of Fender’s basic features, but there’s a few surprises to be revealed. One such feature that stands this guitar apart from the rest is its solid top. It may be spruce, but it’s still a solid top and not a laminate. The guitar does have laminate sides and back, but it’s an excellent start, especially for a beginner guitar. The scalloped X bracing and Fishman pickup system is an iconic touch to the Fender guitar. With the bracing adding to durability, this thing is very well put together. The cutaway top allows for all 20 frets to be easily accessed, especially for the newbie. Now to the hardware. It has a very nice compensated Graphtech NuBone saddle. Getting that accurate and precise intonation will be a breeze. It also has the classic Fender headstock, standard die-cast tuners, and aged-white bridge pins with black dots – a complimenting touch to the black finish. The sound is excellent for this guitar. It packs a mean sonic effect that’s massive but tones down to mellow and smooth. The tones are warm, dense, and full, allowing for the bass to be heard in the mix. This results in a well-rounded, dynamic, and sonic projection of goodness to the ears! If this is what you’re all about, then this is definitely the starter guitar for you! Honestly, other than an extremely few defective guitars received by buyers, there’s nothing to complain about this guitar. It’s seriously top-notch! For the price, it’s a high quality guitar that belies its price. Players love the perfect action, the gorgeous aesthetic appeal, the well-built construction, and the full tones. They also appreciate that it sounds amazing even when it’s not plugged in. Beginners certainly appreciate the built-in tuner that helps them learn how to tune by ear. It’s accurate enough to get the job done. While this isn’t a complete kit package, many intermediate and pro players that already have equipment like that fact that they can buy it solo. However, if you’re looking for the whole shebang, you’ll need a few bucks more to get everything you’ll need! 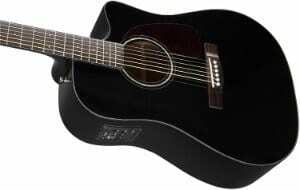 There’s a plethora of Fender acoustic electric guitars to consider in this price range of under 300-400 bucks. You’d be looking at the Fender CD-60CE, Fender T-Bucket 300CE, and the Fender T-Bucket 300. For not much more, the Fender Sonoran SCE is an excellent buy if you’re willing to upgrade. However, the Fender CD-140SCE is still excellent compared to these because of its solid top construction. Outside of the Fender family is the Yamaha FGX800C Solid Top guitar that’s still under 300 dollars and is in every color you could ever want! It’s a very nice guitar that we wrote all about right here! For brand sake, the Takamine GD30CE-NAT is a drooler, and for only a hundred bucks more, it could be yours! This would be a very sweet guitar for a first-time acoustic electric! For more on that piece of work, we have everything you need to know about it here. This Taylor 414ce Acoustic Electric guitar definitely kicks the playing ground out into “wish list” fields. But, there’s no harm in window shopping right? And, for the sake of being thorough, we have the full goss’ on it right here. This extensive list of the best acoustic electric guitars under $500 is a great place to head if you still can’t find what you are looking for. What's the Difference between the Beginner CD-140 and the CD-60? The CD-60 is a completely laminated guitar that also comes with a hard case shell. The CD-140 has a solid top, but it doesn’t come with any other accessories. The solid hardwood lends a hand to fuller, richer, and more natural tones and sound. What are the Electric Components of the Fender CD-140? It comes with the Fishman pickup system that includes the on-board preamp, built-in tuner, volume and tone controls, and a low battery indicator light. What would be the right Size Case to buy for this Beginner Guitar? This Fender guitar has the dreadnought shape with a cutaway. Any dreadnought bag will work perfectly for this acoustic electric guitar. What kind of Finish does the Neck have? It has a gloss urethane finish. The glossy finish makes it easy to slide and use without sticking to the neck. Is this Beginner Acoustic Electric Guitar Available in Left-Hand Models? Unfortunately, there’s only a right hand model available for this guitar. You can see the other 4 acoustic electric guitars suitable for beginners that made our list right here. What kind of Strings does the Guitar come pre-strung with? It comes with Fender 80/20 Bronze strings. What is the Action Level on the Fender? It has medium-low action. It’s easy for beginners to get started with for quick learning. This means Solid Top/Cutaway/Electrics. This guitar is a solid top guitar with a cutaway design and electrics that makes it an acoustic electric guitar. This guitar is available as a bundle which includes a tuner, some Fender picks, a polishing cloth, straps, strings & an instructional DVD. You also get the choice of a soft gig bag or hard case. That is quite a bit to help you get started when just playing it alone will be awesome. But, for plug-in power and some extra tidbits to get you playing above awesome levels, you’ll need a few more items! To strum it up, the Fender Beginner CD-140SCE Acoustic Electric Guitar is an excellent buy. Sure, you don’t get the extra equipment, but it’s definitely worth the cost for the guitar alone. Keep your guitar quality in perspective, otherwise, you might end up going for a full package only to get a turd of a guitar. Keep it real, and keep it Fender!